There are new technologies out there that could help Mateo speak with a voice that is unlike any other. Blending his own natural voice with a donor voice, like his dad’s, VocalID would create a voice of his very own. We’ve been talking with him about it. We want him to make the decision to do it or not. It’s his voice. If we decided to pursue it, it would be something he’d use for many, many years. Right now, its price tag is $1000. He’s worrying whether or not that’s too expensive. I think that’s a pretty cool attitude for a 16-year old. Speech communicating devices come with a limited number of standard voices. His Dynavox has a total of 37 voice options. This includes male/female, child/adult and a few voices with various accents. Some of them sound so robotic, they were not even in the running for consideration. In addition to these voices being used in AAC devices, they are also used in voice prompts at ATMs and on automated telephone voice response systems. Here’s why I think Mateo should choose to have a voice made for him. This voice would be like no other. He could contribute quite a bit of his natural voice which would be blended with a donor voice. His dad is concerned that he doesn’t want Mateo’s voice to sound too much like his voice because he wants Mateo’s voice to be his own. I pointed out that our daughter’s voice sounds a great deal like mine. Mateo’s personalized voice would contain his own pitch, tone, rhythm and loudness. He could use this customized voice for many years to come on his Dynavox, if he continues to use it, or on an iPad with his same core vocabulary — Wordpower. He’s been struggling emotionally so much lately with a desire to communicate naturally as opposed to using technology. Don’t get me wrong. Mateo is a happy guy, but he just wants to speak. He just wants something to come easily to him. For the most part, I can’t help him with any of this. This personalized voice would be something that includes a part of him. In addition to worries about the hefty price tag, we think Mateo is less concerned about having the same voice as many AAC users out there. He’s the only one in our community who communicates in this way. His voice is the only one that stands out in a crowded restaurant or at a school assembly. Here, in our wonderful community, he’s immediately recognized when his voice is heard. The only time he’s surrounded by voices like his own at Camp ALEC, for example, when there are 19 other AAC communicators together for one glorious week. If Mateo went to a school with other AAC users , he might feel a greater need to differentiate his voice from those of his peers. We will be making a decision on this in the next week or so while we can still pre-order his voice at this cost. 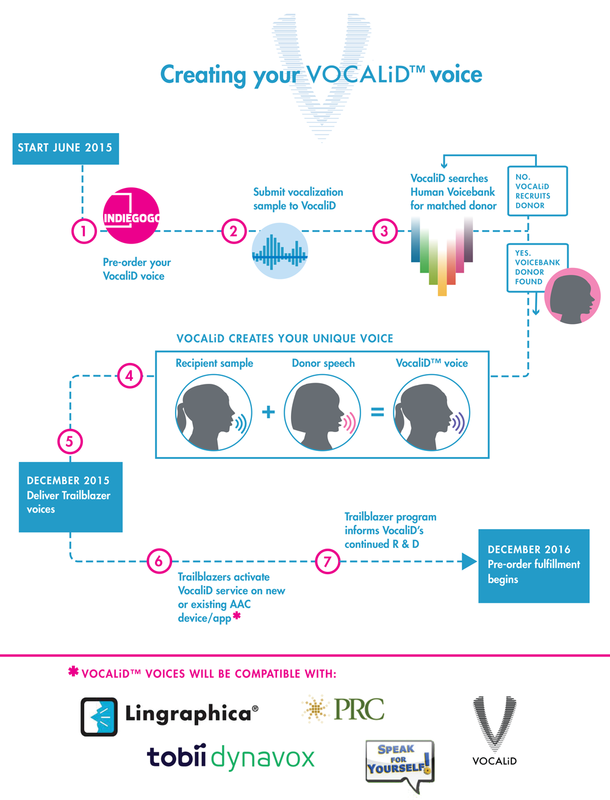 This technology will help many, many individuals to speak with voices of their own. It’s not simply about the personalization of a voice. It’s about improving these voices so that they sound as natural as possible. Please take a moment to look at VocalID. Watch the story of how our friend Maeve obtained her voice. Please consider making a donation to support this research and technology to give voices to individuals who cannot speak. This entry was posted in AAC, Language, SLP, Special Education and tagged AAC, communication, core vocabulary, language, nonverbal, schools, SLP, vocabulary, VocalID, voice. Bookmark the permalink.